Where do children play when it's too cold outside? WEST CHESTER, Ohio — The usual snow day staples aren't available when temperatures dip too low: no snowman building, games of freeze tag, or snowball wars. So when cabin fever sets in, and children can't play outdoors, where do they go? Indoor playgrounds like Jump & Jack's in West Chester are certainly an attractive alternative. "There's areas where you get to slide down, and ropes, and there's like a mini maze," said Cohen Conway, Fairfield East student and exuberant 9-year-old. "This is like a punching bag thingy." Conway and his cousin Kaedynce Pauley were more than happy to provide a tour of the playground as they enjoyed their snow day. "You can go down the slide and play tag and hide and seek and there's a lot of places to run around," said Pauley. 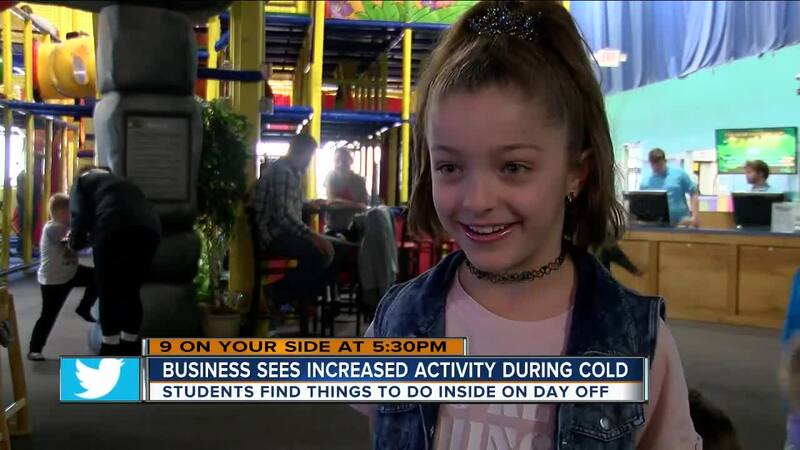 All About Kids daycare facility in Liberty Township brought a group of their kids to the indoor playground today to get some quality play time they were lacking since the children can't safely play outside in the cold. Jump & Jack's day shift leader Landen Day said the facility normally doesn't see many crowds through the weekdays, since children are normally in school. But the team was delighted to have All About Kids join them to play. "Week days are usually a little slower than this, but it's really cold out, kids are out of school, so they want somewhere to get out of the house and play," said Day. Conway and Pauley showed off the facility excitedly, having explored many of the hiding spaces and exciting features. "When you're up high it kind of seems like everything is so little and it looks really cool up high," said Pauley. The two cousins were certainly pleased to have a day off school to play. "My teachers told me that we weren't going to have school tomorrow and I was really happy about it," said Conway. "We were all screaming 'yay we don't have school tomorrow, this is awesome!'" For the kids and their parents, it doesn't have to matter how cold it gets outside when there's still fun to have indoors.